Ideal for deep and uniform tan. A vegetable-based suntan oil, which offers a deep and uniform tan with a long-lasting effect. Walnut and Sesame oils provide natural protection from the sun, while Coconut Oil keeps the skin soft and supple. Walnut oil is a golden-hued oil, extracted from the kernel of the fruit. It is high in linoleic acid and helps regenerate, tone and moisturise dry or sunburned skin. Moreover, rich in cinnamic acid, Walnut oil provides natural protection from the sun. Coconut oil is extracted from dried coconuts. Its light, non-greasy texture does not clog skin pores and gets easily absorbed by the skin. Thanks to its emollient properties, it keeps the skin soft and supple. 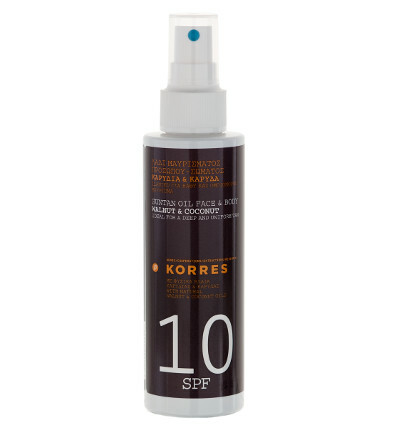 Shake well and apply evenly onto face and body at least 30 minutes before exposure to the sun. Re-apply frequently to maintain protection, especially after perspiring, swimming or towelling. In order to reach the protection level indicated by the sun protection factor, sunscreen products have to be applied in a quantity that is equal to 2mg/cm² (approx. 6 teaspoons for the body of one average adult person). Not using the adequate quantity of sunscreen will lower the level of protection significantly. Do not stay too long in the sun, even while using a sunscreen product. Over-exposure to the sun is a serious health threat. C12-15 Alkyl Benzoate, Sesamum Indicum (Sesame) Seed Oil, Ethylhexyl Palmitate, Dicaprylyl Ether, Butylene Glycol Dicaprylate/ Dicaprate, Ethylhexyl Methoxycinnamate, Triheptanoin, Octocrylene, Simmondsia Chinensis (Jojoba) Seed Oil, Butyl Methoxydibenzoylmethane, Glyceryl Caprylate, Alpha-Isomethyl Ionone, Aqua/ Water/ Eau, Benzyl Benzoate, Caprylyl Glycol, Citral, Citronellol, Cocos Nucifera (Coconut) Oil, Coumarin, Daucus Carota Sativa (Carrot) Root Extract, Geraniol, Glycerin, Glycine Soja (Soybean) Oil, Juglans Regia (Walnut) Shell Extract, Limonene, Linalool, Parfum (Fragrance), Phenylpropanol, Rosmarinus Officinalis (Rosemary) Leaf Extract, Sorbic Acid, Tocopheryl Acetate. We are located on the buzzing Main Road, at the heart of Hersonissos. Hersonissos is a 20-minute drive from Heraklion and a 5-minute drive from Malia.